Party hardy, Mardi Gras! For a limited time only take 20% off site-wide to help you party Mardi Gras style. 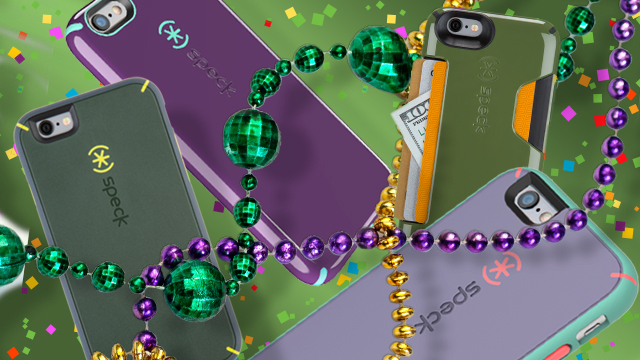 See which purple, green, & gold discount phone cases are our favorites for a night out on the town. Our best-selling, award-winning CandyShell is one slim iPhone case that packs in military-grade protection to let you use your hands for partying, not for protecting your phone. Looking to jazz up your style a little bit? Go full luxe with our new Luxury Edition iPhone 6 cases, or show off your swag with our completely clear military-grade protective iPhone 6 CandyShell Clear case. Don’t miss out on the party this year. Be sure to check out the rest of our discount iPhone cases as part of our 20% off site-wide sale. Hurry – these deals won’t last long!